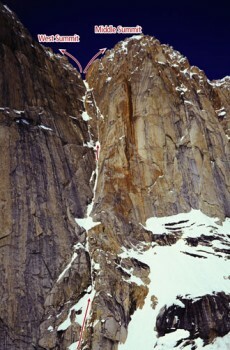 This narrow ice ribbon splitting the immense granite walls of the south face of the Mooses Tooth is an alpinist’s dream. Although it doesn’t provide an easy way to the actual summit, the outstanding nature of the climbing makes it exceptional. And with its easy access and short approach, this is about as good as it gets for Alaskan alpine climbing. The climb is similar in ambience and slightly more difficult than its sister climb, Ham and Eggs. It has lots of easier climbing after an initial crux, which helps you gain elevation quickly. This leads to the narrows—an amazing 500-foot runnel of excellent quality alpine ice that is barely two shoulder widths, sometimes narrower. The highlight of the climb is a wildly steep and thin but short and well-protected crux high on the route. A trip to the West Summit is a good way to cap off the ascent. Which SuperTopo guidebooks include a topo for Shaken, Not Stirred?